“When they were asked to identify themselves, they all produced Rwandan identity cards but had no immigration documents allowing them entry into Uganda, says Police's Vincent Mwesigye. KASESE - Police in Kasese say they have arrested 44 Rwandan nationals in Queen Elizabeth National Park. Rwenzori East Regional Police Commander Vincent Mwesigye said they were intercepted by traffic officers at Katunguru aboard two passenger mini-buses on Wednesday. He said the vehicles' drivers would be charged with overloading. “When they were asked to identify themselves, they all produced Rwandan identity cards but had no immigration documents allowing them entry into Uganda,” Twesigye said during a press briefing at his office on Friday. “They admitted to having moved into Uganda via various Uganda-Rwanda border points along Kabale [in western Uganda],” he added. Mwesigye said the Rwandans were then driven to Kasese where they made statements before being released. "We wouldn’t have arrested them if they had entered Uganda legally, which the East African Community has now made easy,” he said. "We are going to screen them and cross-check the statements they have made and establish the borders they purport to have used and educate them on how to enter our country legally next time,” said senior immigration officer Joyce Kabasongora. Earlier this week, American Kimbley Sue Endecott and Ugandan driver Jean Paul were reportedly abducted by four armed men in Queen Elizabeth National Park. 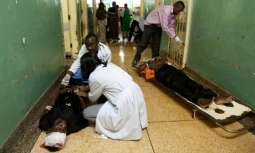 The kidnappings led to Ugandan security forces to launch a hunt for the alleged kidnappers. Government's announced plans to rationalize and merge agencies, commissions and authorities as a way of reducing wasteful expenditures and cost saving is a hoax, civil society organisations have said. Last year, on September 10 government announced the phased merger of the authorities and agencies, sending panic among civil servants. However, civil society has said no merger will be realised at least in FY 2019/20 because nothing is reflected in the national budget framework paper. Activists under the their umbrella body Civil Society Budget Advocacy (CSBAG) led by Julius Mukunda, the executive director, observed that the public should not expect much. “We commend government for this policy of merging, however, the 2019/20 budget framework paper does not capture any progress so far made in realizing the policy choice,” he said. Mukunda who was addressing the press at CSBAG headquarters in Kampala recently added that there is likelihood of anxiety and job security concerns that might affect the smooth implementation of the government programmes. “Government should complete and communicate the roadmap for the massive policy decision to guide proper budget implementation,” he said. At the conference, CSOs also noted that State House does not have the required expertise to competitively oversee the Youth Livelihood Programme (YLP). They argue that taking over of the programme from the minister of Gender, Labour and Social Development opens risks of politicization of the government programme. It should be remembered that government introduced the Youth Livelihood programme in 2013/14 as a five year programme to economically empower the youth. But in FY 2019/20 cabinet approved and amended National Budget Framework Paper votes for Youth Livelihood programme. “The budget of YLP at State House rose from Shs 0 in 2018/19 to Shs 130bn in 2019/20 yet State House operations are almost beyond public scrutiny and has limited parliamentary oversight,” said Julius Kapwepwe, the director programmes at Uganda Debt Network. The auditor general, John Muwanga recently released a report revealing that government may never recover Shs 28.4 billion disbursed to youth groups across the country under Youth Livelihood Project (YLP). The auditor general found that almost 64 per cent of the sampled youth projects, consisting of 71 per cent value of loans, were non-existent and another 25 per cent had reportedly embezzled the funds. About moving taxis, trains, and buses the future is driverless driving of these vehicles. In 20 years time cash money will not be in use in much of this world and funny enough these current unemployed poor youth will be the adults working hard for their pension life of 2050. How then can one be telling these youth in 2020 or 2030 that you must pay up the NRM government cash debts of 1986/2021? For the past few weeks, President Museveni has been touring Kampala and its environs in what political pundits see as an extension of his early campaign for a record sixth elective term as president. These manoeuvrings seem to have been given added urgency with the emergence of Kyadondo East Member of Parliament Robert Kyagulanyi (Bobi Wine). The MP’s message for change, and a new liberation, is resonating with Uganda’s youth who constitute majority of the country’s 40 million people. Kyagulanyi was barely five years old when the NRM shot to power 32 years ago. If Museveni had honoured his word to retire those many years ago, it is unlikely that Bobi Wine would have abandoned his music for politics. 2018-10-17 - After Muntu, who is loyal to FDC? Now, the musician finds himself in the strange position of joining the effort to send Museveni home after more than three decades in power. In the earlier years of his presidency, Museveni had often talked about transition to another leader. In his book Sowing the Mustard Seed [1997 edition], Museveni writes that the NRM had only two cardinal roles; one being the laying of a firm foundation and preparing the ground for security and political stability. The other being to ensure orderly succession of political authority. “Looking further ahead, I’m optimistic about Uganda’s future. Our present line of progressive development might get delayed along the way, but I don’t anticipate any serious breakdown as happened in the past, unless we get confused political groups in charge. They might delay the industrialisation and economic liberalisation process but the fundamental principles are now in place. There are now people of presidential calibre and capacity who can take over when I retire and I shall be among the first to back them,” Museveni wrote. But he was to contradict himself years later in the 2000s, astonishing the country with the claim that he was the only one with a vision to lead Uganda. Museveni has also over the years kept on flip-flopping on his retirement. We look at some of the promises. In his book Sowing the Mustard Seed, Museveni writes that when they came to power in 1986, the NRM formed the National Resistance Council as the national governing body; the equivalent of the present-day parliament. Museveni wrote that this meant that the interim period was due to end on January 25, 1990. However, as the interim period neared, in 1989, Museveni influenced the expanding of the NRC through indirect elections. He argued that they chose indirect elections because of logistical challenges. He said they did not have enough money or vehicles to mount a full national ballot with most of Uganda’s roads still largely impassable. To him, this answered the promise to surrender power after four years. “Originally, we had said that the group which took power in 1986 would be in government for four years and we kept that promise; before the end of the four years a new group had come in. The expanded NRC of 1989 was not the same as the old one of January 1986,” Museveni wrote. However, to people like Wasswa Ziritwawula (a former NRC member who resigned in protest), this ‘usurpation of the people’s power’ was the first step in Museveni’s quest for life presidency. On July 20, 1995, Museveni told residents of Kisoro district that he was on his way out. “When I reach 55, I will not be in public life anymore, I told you this when I was 48. I’m ready to help Ugandans and Africa in public life up to the age of 55,” Museveni was quoted as saying in The Monitor of July 21-24,1995. Going by that promise, Museveni shouldn’t have contested the 2001 elections. It was that same year that he wrote in his election manifesto that 2001 was the last year he was standing for president. In October that year, he gave an interview to the BBC in which he said he was desirous of leaving power at the end of his two constitutional terms. This too was not to be. Almost immediately after being sworn in as president for the second and final elective term, voices started emerging within the NRM calling for the lifting of term limits. In 2005, term limits were scrapped after the bribing of MPs with Shs 5 million. After doing away with term limits, the only legal impediment to the life president project were the age limit provisions for presidential candidates in Article 102(5) of the Constitution. Prior to the amendment of the constitution, Museveni had unequivocally told NTV’s Patrick Kamara that there was, certainly no chance of him standing as president beyond 75 years. One reckons those who have stumbled are very many during the history of Uganda from 1962. They are many like Obote I and II, The Uganda Army, Idi Amin, and The Parliament of Uganda. Interesting indeed that the current ruler has stumbled 5 times. What of his time with the UNLF? MEEYA w’e Kyengera Hajji Abdul Kiyimba akkirizza nga bwe yanywa amafuta ga poliisi ng’akola emirimu gyayo egyo buzimbi. “Nze nakoma okunywa amafuta ga poliisi ng’omugenzi Kaweesi akyaliwo era yagampanga mu kiseera kye yali yampeera obuvunaanyizibwa okuzimba ekisenge ekiteesezebwamu ku poliisi y’e Katwe n’e Kabalagala,” Kiyimba bwe yategeezezza. Yayongeddeko ni teyakoma kuzimba poliisi ezo zokka wabula yazimba n’ey’e Nsangi era nga mu mirimu gyonna ye yali akuh− haanya obuyambi n’okusomba amatoffaali, amayinja n’omusenyu era amafuta gaakolanga mulimu guno gwokka. Yagambye nti kuno yagattako n’okugula ettaka ku bukadde 40, ku ssente ze ng’omuntu e Lwengo n’aliwa poliisi n’atoola n’obukadde obulala 56 n’azimba poliisi eno kubanga gye bamuzaala era bwe yali ewedde n’agikwasa poliisi. Gen. Kayihura yennyini ye yagitongoza. “Era Museveni yalagira ne Kayihura ne bantwala e Soroti ‘nampa omudaali olw’okukolerera poliisi. Yagambye nti, “Kayihura bw’aba alina ebizibu bye ng’omuntu tumusabire kubanga y’amanyi ebibye. Era nze nakoma okukolagana ne Kayihura emyaka ng’esatu emabega bwe yayimuka mu lujjudde lw’abantu e Kibuli ku muzikiti n’agamba nti tammanyi nange ne muvaako. Era hhenda okuddamu okumusisinkana n’amusanga mulumbe lwa Kaweesi e Kulambiro n’e Lwengo era okuva olwo siddangamu wadde okwogera naye. Wabula ekisinze okunnuma eggulo (Lwakubiri) nabadde naakava mu lukiiko olwatuleeta n’omumyuka wa Mufti owookubiri, e Boston mu Amerika ne nfuna amawulire nga gagamba nti Hajji Kiyimba bamukutte ng’ali ewa Hajji Moses Kigongo e Maya bw’akubye essimu ewa pulezidenti nti Kiyimba ali wano n’amulagira bankwate bangatte ku Kayihura ekitali kituufu. Nze mbadde waakudda wiiki ejja kubanga mbadde nnina ab’okusisinkana mu Amerika okutema empenda ngeri ki Kyengera Town Council bw’eteekebwa ku maapu. Naye byonna mbisazizzaamu. Kiyimba okuvaayo okutangaaza ebigenda mu maaso kiddiridde olukalala lw’abantu abamu okufulumizibwa nga balumiriza ne Kiyimba okunywanga amafuta ga poliisi. Era nga kuno kuliko n’omu ku bameeya ba munisipaali y’omu kibuga Kampala era nga essaawa yonna bagenda kulabikako ku poliisi e Kibuli babitebye. Mukulu Kiyimba, nga gwe eyasoma okuzimba, oli bwakugamba nti mala ganzimbira bwoti tokiriza nga. Oteka nga wo plan eyiyo enungi nebisale byosobola okugizimbira. Oluvanyuma bwagana nga obivamu. Nkuwadde gabwerere. Oba ono omusajja omuganda owa NRM abadde azimba police ze Buganda amaze nalaba ebizimbe bya Police bwebabizimba wano mu America gyakyadde? Omuganda wesisiwala bwotunulira abakuumi be ddembe mubizimbe mwebakolera emirimu gyabwe wano ewaffe e Buganda! Ate nga mukulu Abdul Kiyimba yomu kubalondebwa okubizimba nabifuna mu nomudaali gwa African Civil Bulding and Achitecture. The International Criminal Court in the Hague, Netherlands has awarded $10 million in compensation to child soldiers recruited by Congolese warlord Thomas Lubanga. The International Criminal Court said Lubanga was liable to pay the full amount to his young victims and their relatives, but added it recognised there was no way he would be able to afford paying this compensation that is the largest of its kind in history. The court therefore instructed contributions would be sourced from different parties including the Democratic Republic of Congo to fulfill this payment. The will also monitor Lubanga’s financial situation as he served out the remaining year of his sentence to see how much he might be able to contribute to the Court Trust Fund for Victims. In 2012, Thomas Lubanga was convicted for using child child soldiers and sentenced to 14 years in jail. His was the first conviction handed down by the permanent war crimes tribunal. Aid agencies estimated that 5.4 million people died as a result of war and ensuing hardship in the Democratic Republic of Congo between 1998 and 2007 – more than in any other conflict since World War II. The court in The Hague said the payment would fund psychological support and job training programmes for 427 victims identified during the proceedings. It acknowledged that many more children had been conscripted as soldiers. “Further evidence established the existence of hundreds or even thousands of additional victims affected by Mr Lubanga’s crimes,” the court said in a statement. The judges awarded $8,000 per person, or $3.4 million for the 427 victims recognised so far, with an additional $6.6 million for potential future awards. In March, the ICC ordered another Congolese convict, former militia leader Germain Katanga, to pay $1 million in damages to victims. This is the sort of international justice President Museveni is frightened of if he leaves power in Uganda. It is evening and in Masaka Town’s main business centre there is increased activity with many cars on the streets and a big number of people walking the pavements in a rush to return home. On one of the pavements, a woman holding a bucket quickly steps out of a shop whose door is halfway closed and looks left and right at the busy street before proceeding to the edge of the pavement and emptying the contents of the bucket. To passers-by, she gives the impression of someone who has just been doing a bit of her personal cleaning, in preparation to return back home. She then returns the empty bucket to the shop before finally locking up convinced that everybody that saw her empty the bucket believed the liquid she poured on the street was merely dirty water. 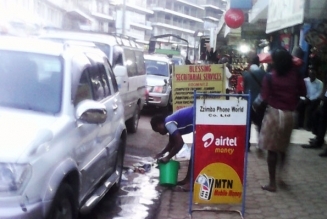 This is the new trend in Masaka Town now except that yellowish liquid is not dirty water but urine because many shopkeepers have turned buckets into urinals. Shopkeepers keep a bucket behind the shelves in the shops, into which they urinate whenever mother nature calls. The urine is mixed with water to disguise it and then poured out on the streets just before the shops are closed every evening, something that explains the pungent smell of urine in the town. “It is a nuisance we are out to fight,” says Joseph Kimbowa, Masaka’s outgoing town clerk. Kimbowa reveals that a few months ago, some shopping malls were closed on account of landlords failing to provide lavatory facilities yet this is a major requirement before they are authorised to rent out their business premises. “Failure to have toilets is unhygienic and attracts diseases. Soon, our teams will be out on the streets to arrest them and we will use their buckets in the courts of law as evidence against them,” says Kimbowa. Nalumansi, a shopkeeper, however, has an explanation for urinating in a bucket at her shop along Elgin Road. “Every visit to the toilet on this building costs Shs200. As we sit in our shops we drink tea, juice and eat food, so we have to visit the toilet. If I have to visit the toilet four or five times in a day, that would be parting with about Shs1,000,” she laments. Many shopkeepers blame landlords for this state of affairs. “Only very few of the shop premises are self-contained,” says one female trader, adding, “In the majority of cases, a big block of shops have to use one or two toilet rooms. They are often congested and not always clean. When you get there and the facility is occupied and two or three other people are still waiting outside to use it, valuable time is lost. A typical case is recently, when the taxi park was shifted to a free space in front of Laston Building along Masaka-Kampala road where there is no public toilet. “They claim the place is near to travellers who want to board taxis. We will definitely be driving them back to the main taxi park, because they are insisting that the park where we want them to go has no functioning toilet,” Kimbowa says on the matter. Masaka’s dilemma of inadequate public lavatories can be seen in the dilapidated structures built just before independence and in the 60s at the town’s defunct bus park, the municipal council and at Katwe roundabout.